Candyman, Candyman, Candyman…Candy – I can’t even make it to four times on a freaking written review! That’s the kind of impact this nightmarish slasher had on kids growing up in the 90’s. For a while Candyman was one of the movies often talked about in between classes, but few had actually experienced the fear and the violence elicited by the gory hook which had replaced Candyman’s right hand. I hadn’t seen Candyman for years, but thanks to Rue Morgue, the TIFF Bell Lightbox and Fan Expo, fans had a chance to watch a 35mm print of the beautiful and talented Virginia Madsen opposite one of the most iconic killers in the history of horror cinema. 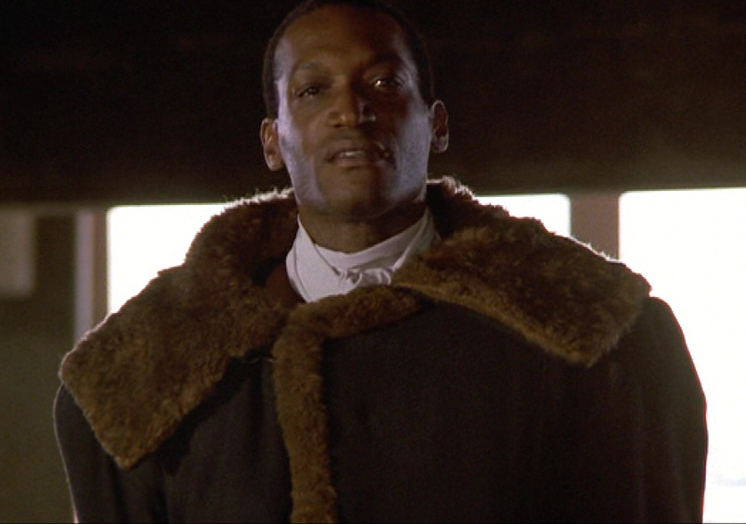 And that’s not the end of the story: Tony Todd, the Candyman himself, would be present for a Q&A after the screening. If this doesn’t excite you and strike a little bit of fear into your heart at the same time, then you may not be familiar with the story of the Candyman. Based on The Forbidden, a short story by the prolific and talented horror author, Clive Barker, Candyman is the story about two graduate students trying to complete a thesis about the origin and transmission of urban legends. Helen (Madsen) and Bernadette (Kasi Lemmons) are having a difficult time coming up with an urban legend that hasn’t already been investigated ad nauseam. 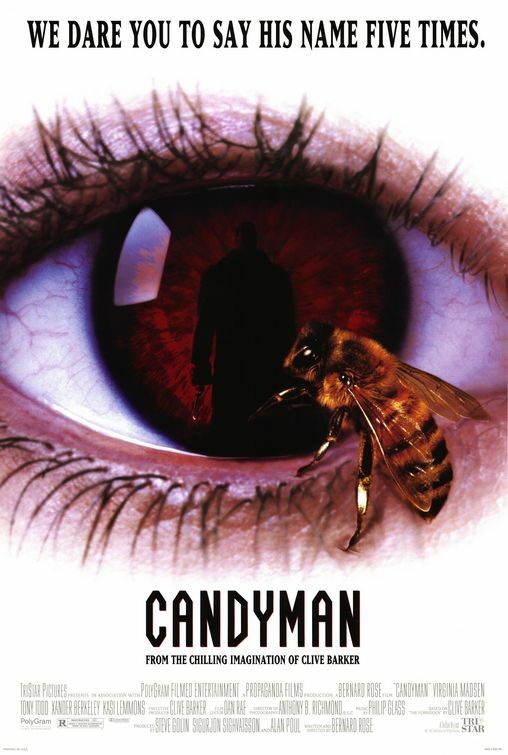 However, while conducting a series of recorded interviews Helen comes across the legend of the Candyman. In the poorer areas of Chicago the residents seem to attribute horrible killings to a murderous ghost or vengeful wraith with a bloody hook in the place of his right hand. Once a slave, the Candyman experienced an unfathomable amount of pain in life and a little over a century later looks to share his horrible past with the living. Despite the horror of the urban legend, it seems easy enough to avoid the Candyman – don’t say his name five times while looking into the mirror. Unfortunately, the curious and incredulous Helen can’t help herself, and after chanting his name her horror begins. Despite a couple of issues, Candyman holds up remarkable well after an unbelievable 20 years since its release. The movie feels incredibly violent and bloody, yet there isn’t a lot of onscreen violence. I can’t help but think that this feeling is elicited by the great practical effect of Candyman’s gore-covered hook. Rose uses many close-ups of this weapon throughout the movie and as a result it becomes embedded in the viewers brain. This sort of psychological skill seems hard to find in the current crop of slasher movies being made, and it’s really a shame as it is much more effective than having a high body count. The chemistry between Tony Todd and Virginia Madsen is incredible, with Madsen turning in a particularly amazing performance as an intelligent and adventurous graduate student who gets a little too attached to her research as many graduate students are apt to do. During the Q&A Todd told the audience that he and Madsen practiced fencing, horseback riding, and other elegant sports or activities in order to ensure that their chemistry was as close to genuine as possible when they finally shot the film. Another interesting story brought up during the Q&A involved the amazing ‘bee’ scenes in the film, in which bees crawled all over Todd or Madsen. One scene in particular had a few dozen bees crawling over Todd’s face and open mouth. He assured us that this was in fact REAL. The shot was made possible by placing a device in Todd’s mouth which would prevent the bees from crawling into his mouth and down his throat. The filmmakers also hired a ‘bee wrangler’ for the set with the focus on using young bees, as they don’t develop the ability to sting until they have reached the 12-hour milestone in their lives. Despite these precautions, Todd was still stung 26 times while shooting the movie, and collected a cool $26,000 in the process as he had a ‘$1,000 a sting’ clause in his contract thanks to a savvy lawyer. There were only two issues that really bothered me about Candyman: a particular costume and a bit of sloppy logic in the story. Firstly, why in the hell does Candyman wear chef pants and a fur coat? Maybe this worked back in 1992, but it was a little distracting in 2012. Last time I checked Candyman was not a pimp. I also found myself waiting for Flavor Flav to jump onto the scene and start a public enemy music video. Secondly, when Helen gets arrested for the first time the police think that she has beheaded a dog, attacked a young mother with a meat cleaver, and finally kidnapped a small child and is the only one who knows his whereabouts. Of course they promptly let her out on bail and allow her to go back to her apartment. I can’t believe that this seemed logical in 1992, but I don’t recall having a problem with it then. It was a great night out at the Lightbox; Candyman looked great on 35mm, and Tony Todd had a hugely entertaining Q&A with local film critic, Richard Crouse. I can’t wait until Rue Morgue and TIFF screen another classic horror film like this and really make it an event. Todd also told the audience about another screening in Toronto that he is attached to later in the year, although he was not clear if he will be present for it. More news on this in the near future.